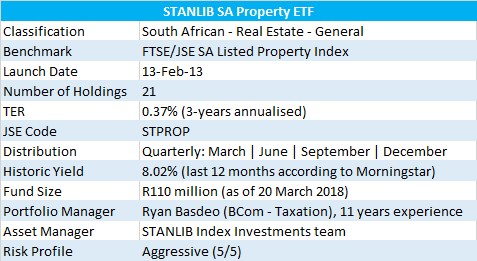 Over the course of this series, we have profiled four property ETFs, three domestically focused and one with an international flavour.� In this fifth week of the series, we profile the fourth and last locally focused property ETF in our list, the STANLIB SA Property ETF (STPROP). The STANLIB SA Property ETF was launched on 13 February 2013, and thus enjoyed its 5th year anniversary two months ago. The ETF has a market capitalisation of approximately R110 million as of close of trade on the 20th April 2018. The objective of the STANLIB SA Property ETF is to track the SA Listed Property Index (SAPY), as closely as possible. The fund invests in the constituents of the SA Listed Property Index and aims to replicate the index by holding the same weightings of these constituents. The SAPY is an index of the top 20 liquid property companies by market capitalisation that have a primary listing on the JSE. The fund is rebalanced quarterly, and may also hold a small portion in cash instruments and listed derivatives to effect efficient portfolio management. The current holding in these instruments is hard to determine given that the last fact sheet available on the STANLIB website is as of end of December 2017. 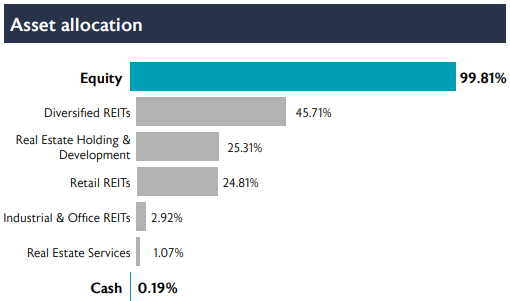 According to that fact sheet, 99.81% was invested in property and property-related equities. The remainder, 0.19% was invested in cash - no sign of derivative or alternative instrument exposure, at least as of December 2017. Digging deeper elsewhere on the internet, we find a representation of the fund’s exposure on Morningstar, as of 31 March 2018. There, the split was 97.54% invested in equities and 2.46% in cash, and so again, no sign of alternative instruments being utilised in the portfolio. 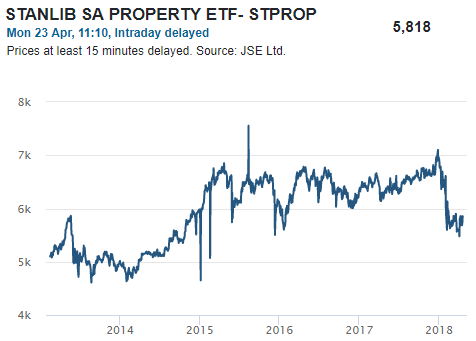 During this series, reference has been made to capped and uncapped index tracking, and as far as the STANLIB SA Property ETF goes, this portfolio construction approach falls squarely into the uncapped category. As such, heavy weightings in individual stocks may persist for long periods of time. 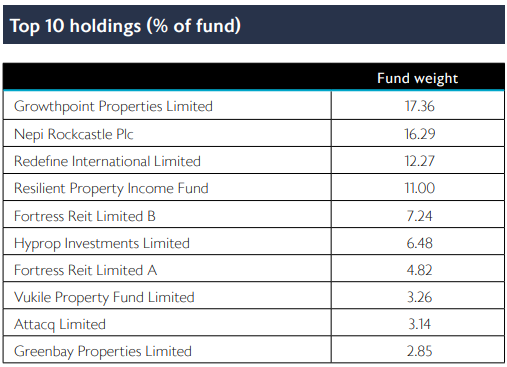 In the absence of an up-to-date fact sheet, Morningstar has indicated that as much as 22.09% was exposed to one counter, its biggest holding, Growthpoint Properties, as of 31 March 2018. The jump from December to March would have largely come from the Resilient group of companies falling so dramatically year-to-date. It is one of four ETFs in our series that tracks a South African Property Index, but only one of two in our series that tracks the FTSE/JSE SAPY, without customising or capping the constituents. The other ETF is the CoreShares PropTrax SAPY (PTXSPY). The TER of the CoreShares version is 0.58%, while the STANLIB ETF is less costly at 0.37% (Annualised 3-year TER). What type of portfolio/investor would benefit most from holding this ETF? With over five years’ track record, those who invested within the first few months of the ETF’s launch have fared better than those who for example only invested at the start of 2018, where the fund has delivered negative 16.5% year to date (as of 20 April 2018). The merits of having a longer-term view are captured in the five-year chart below. As we have come to expect from a passive ETF, it lags the index it tracks marginally (due to tracking error and costs). As of 31 December 2017, the portfolio had a (since inception) annualised return of 13.33% vs the benchmark, which returned a figure of 13.66%. Investment starting point is so very often a crucial part of extracting performance, and in this case, if the first three months of the 2018 year is included, the 5-year annualised figure comes to a substantially lower 3.62% return.